Next week’s Pinterest IPO will be the second largest of 2019. And the stock just got its first BUY RECOMMENDATION. Go here to claim pre-IPO shares today – before the IPO. You don’t need to be a rich “accredited investor” or have special Wall Street connections. Let me take you inside the Pinterest IPO. After reading this, I think you’ll understand . . . Most folks will wait for “PINS” shares to start trading on the New York Stock Exchange. But there’s a much better way to invest in early stage companies – including Pinterest and Uber. So, let’s get started with details on next week’s Pinterest IPO . . . The company is a social media platform where users share photos, designs, recipes, crafts and ideas. Women comprise over 71% of the Pinterest audience. The Pinterest website and app reach 250 million people every month. Pinterest sells advertising on its website and mobile app. The company benefits from a trend of advertisers moving away from print, radio and television. And as they do so, they’re spending more money online. Last year, Pinterest generated $755.9 million in advertising revenue. How quickly is the company growing? Pinterest is growing very rapidly. The following chart shows that the number of users has doubled in the last three years. Meanwhile, sales have jumped 153% during the same period. That’s because Pinterest is building out its advertising platform. And the company is doing a better job generating money from its users. Last year sales grew 60%. Last year, the company reported a net loss of $62.9 million. That was down over 50% from 2017, when Pinterest lost $130 million. This shows that Pinterest aiming to become profitable in the very near term. And the company is working to control costs. 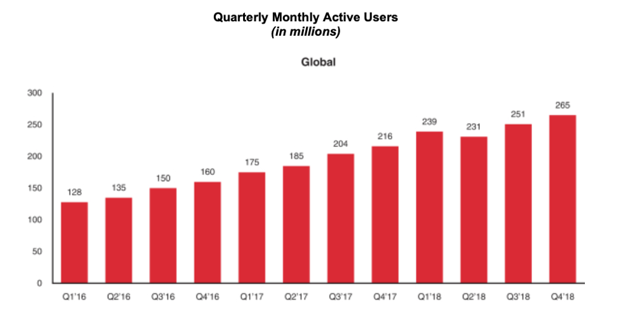 It also suggests that Pinterest could turn a profit in 2019. Once the company begins churning out quarterly profits, the stock could become more attractive to investors. What are the details on the IPO? Access tomorrow’s LIVE briefing for all the details . . . Including how to claim Pinterest pre-IPO shares (just click here). The current IPO price is set at a range of $15 to $17 per share. Is the stock a “BUY”? Pinterest recently pared back its IPO valuation. That happened after Lyft’s IPO in March. You’ll recall that Lyft aggressively raised its IPO offering price after strong demand from investors. As a result of an aggressive IPO price – and over $1 billion in annual losses – Lyft stock has been under pressure. Shares are now trading around $62, below the $72 IPO price. Pinterest doesn’t want a repeat performance. So, the bankers at Goldman Sachs and J.P. Morgan are going to be more cautious and keep the IPO price down. That should set up Pinterest shares for a healthy first-day jump. Right now, you have just two choices. First, you can wait for Pinterest to go public next week. And you’ll probably end up paying $17 – $20 per share – once it opens for trading. Second, you can become a Pinterest pre-IPO investor. By securing private shares of the stock – just a week before the company goes public. Wall Street billionaires and Silicon Valley insiders have used this secret for years. Unfortunately, they’ve gone to great lengths to LOCK YOU OUT. Because I’m going to reveal this secret pre-IPO loophole. And you can use it to secure shares of Pinterest and Uber – before these stocks go public. Just click here now (it’s FREE).